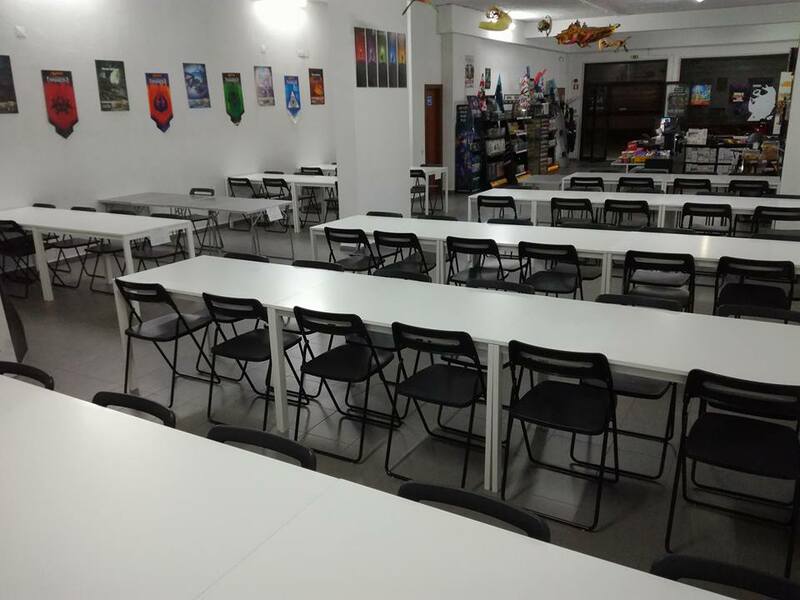 During the month of July I saw an announcement regarding a Modern PPTQ in Versus Gamecenter, a local game store in the capital city, on the 5th of August. A full set of Tarmogoyfs for first place, a couple Lilianas for the finalist, and some fetchlands for the rest of Top 8. “Awesome, let’s assemble the team!”, I thought. With a 70 player cap, we needed to be fast and sleeve up our decks to start practicing. However, most people on my team were out of the country, and the rest of them didn’t want to go. So, I gave up on my dream and asked the Head Judge if I could be part of the judge team. I would come from Paris the day before by plane and I could stay in the city for the day after. It would be of use to me. He said, “no problem!”. “He told me last Wednesday it was about 60 players”, I replied. The check-in for the tournament was between 10h and 11h, so the HJ asked me and the other FJ to be there half an hour earlier than that for the Judge meeting. The HJ for this event was Filipe Fernandes (L2). The Floor Judges were Luis Guimarãis (L2) and I (L1 at the time). As a L1, the HJ asked me that everything where I would step in that was covered by the IPG, I needed to call a L2 to assist me in order to make sure I wouldn’t miss the infraction, penalty or fix. If the high attendance was confirmed, we would make just 1 deck check per round (shifting between beginning of round and midround), and only for the first 6 rounds. This would help us have a better floor cover, while checking the minimum 10% of the lists and scouting the top tables in the final round for bribery or improperly determining a winner. The deck checks would be made by me and the HJ, while Luis would cover the floor. We would try to count and verify all the lists during morning, if that was possible. We did this in a way that didn’t harm the floor cover. Each of us had around 35 lists and while we were standing on the floor, we were counting the lists. Looking back at it maybe the best thing to do was to simply forget this and count only the lists that had any chance to go into top 8, prior to the last round. After our meeting, we helped the organization in some logistical aspects. We got some more chairs from a local restaurant that lend them to the TO and we rearranged the extra tables we needed. 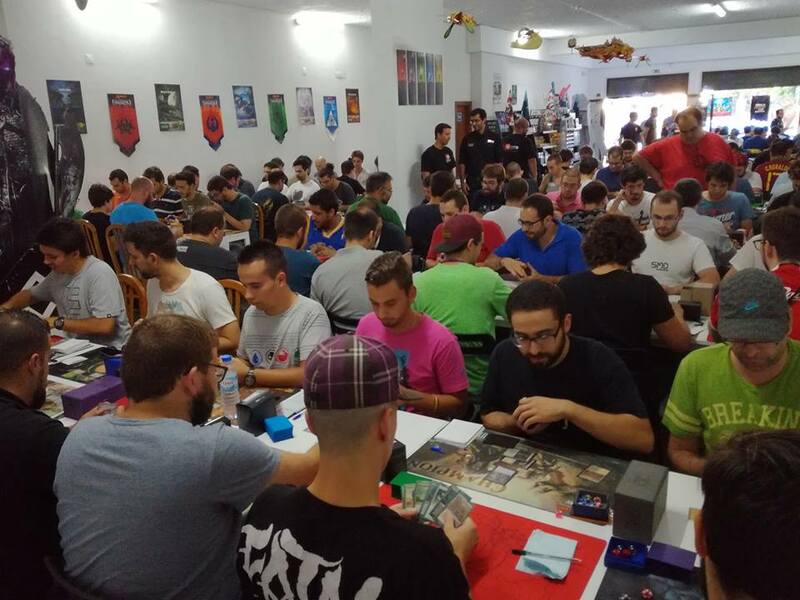 Soon it was 11AM, and the check-in desk was closed – 107 players were present in the tournament, making it the biggest PPTQ ever made in Portugal and it was an honor for me to be involved in it in the first place. This also meant we would have 7 Swiss rounds, and a cut to Top 8. 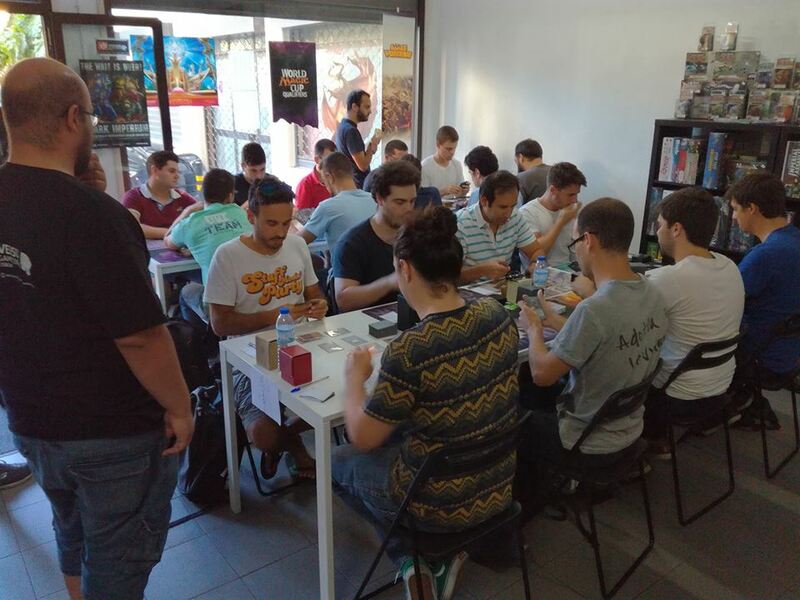 As we had such a high attendance, the HJ decided to seat players alphabetically, in order to collect the decklists and make it easier for us. After the announcements, we started the first round at 11:30AM. The current report will focus more on Policy questions and some psychology behind players and plays and in the end there will be some rules questions that did come up during the tournament, so stay tuned! The first round of the tournament was relatively calm. There were some calls related to rules and some other asking for Oracle texts, while the second round was the one with most calls during the whole tournament. By this time, I have finished the verification of my 30-something lists and I helped the other FJ verify the ones he had left. 1) A player, playing Eldrazi and Taxes, had just played a Flickerwisp, and with the trigger on the stack, he activated Eldrazi Displacer ability, targeting the same Flickerwisp. At this point he asked me when the ability at the bottom of the stack would resolve if the exiled permanent would stay exiled forever, since the Flickerwisp on the battlefield right now was not the same object of that ability. I understood that this player was confounding this with the Tidehollow Sculler interaction, a card that’s part of the same deck. I wouldn’t want to give strategic advice, so I just responded that the ability created by the Flickerwisp is a delayed trigger, that is applied to the target object and the fact that the Flickerwisp is no longer on the battlefield has nothing to do with that. He didn’t seem convinced and I offered the appeal. However, his opponent said “You’re confounding it with the Fiend Hunter ability”. The player realized the mistake and proceeded playing. After a lunch break, the third round started and as soon as players were seated, I got a call. A player has seen one of his opponent’s cards while shuffling the deck. As it was before drawing their opening hands, I wasn’t sure if it was a Game Play Error – Looking at Extra Cards and I quickly ran my notes to search for an infraction in the Tournament Errors, but I failed to find one. So, talking with the HJ, he agreed that despite not being during the game play, it is definitely a LaEC and I issued a Warning to the player. Right after that, I had another policy-related call. AP had cast Searing Blaze on NAP’s vanilla 3/3, but NAP controlled a Leyline of Sanctity. I explained why the play could never be made in the first place and with the HJ permission I made a simple backup, to the point before the spell was announced. I issued AP with a Warning for GPE – GRV. As we had some work during the first minutes of the round, we couldn’t make a deckcheck this round. This means we had to make 2 deckchecks during the fourth round! Speaking of which, the fourth round was the one where we had less calls, so we could do the 2 deckchecks! Just a rules question (don’t forget about the Q&A in the end!) and a policy problem:NAP controlled a Leyline of Sanctity and a Nahiri, the Harbinger. AP attempted to cast his Kolaghan’s Command trying to give 2 damage on Nahiri and returning a creature to his hand. I instructed AP that he can’t target a planeswalker with that spell. Instead what he is doing is targeting a player and then redirect damage to a planeswalker that player controls. As NAP can’t be a legal target, this was an illegal play. I issued AP with a Warning for GPE – GRV and backed up the game to the point before Kolaghan’s Command was announced. Fast forwarding to round 6, there was a question where I messed up a bit, but fortunately it was nothing major: a player wanted to know if he could target Ghost Quarter with its own ability so he could get a land. I answered no, but I should have explained better. Ghost Quarter can indeed target itself, but its ability is countered on resolution due to its target is no longer on the battlefield, thus failing to find a land. This served as a lesson for me, to not be that impulsively answering questions. For me it was obvious that it couldn’t be done, but it was clear that it was not that obvious to that player. After pairings for last round were posted, a player came to me asking a recurrent question. He asked if it’s legal to propose a concession in exchange for half the prizes to his opponent. I explained him this would fall under USC – Bribery and he can never propose or ask for a concession in exchange for anything. Then, right after the round started, one player called, saying he discovered a card from the sideboard in his opening hand and after confirming, he said he had forgotten to de-sideboard all cards he used in the previous match. This is the all-new TE – DP, and the Penalty is a Warning. I went to the HJ because this is a policy related question and explained the situation so I could issue the penalty and fix it. When I got back to the table, I explained the player that we would remove the cards in his hand and deck that belong to the sideboard and add the ones from sideboard that belong to the deck, and after that he could mulligan. This time however he said that the card from sideboard was the first he had drawn that game and that he had another already in his hand. He confirmed to me that he didn’t have any copy of that card in the maindeck and I asked him if he didn’t notice it in the opening hand and he confirmed he didn’t. The card in question was a Path to Exile. I observed the battlefield for a moment: his opponent had a turn 1 Sleight of Hand into Lotus Bloom. This was were I discovered that a judge should know most of the decks that are currently being played in a format. As a Modern-lover, I immediately felt something was not right. If I was playing against him I would suppose he’s playing Ad Nauseam, a combo deck with just 1 creature, so Path to Exile is the last card I would want to have. I went to the HJ again, explaining the situation and that I had a suspicion this player had covered the fact he failed to desideboard and possibly cheating. The HJ conducted the interview while I had to attend another call, about a player that had scooped while at 3 life after his opponent played Atarka’s Command targeting him with a sick Dryad Arbor. I told him that we couldn’t reconstruct the game state so it was considered a loss for him. However, I asked his opponent if he didn’t know that Dryad Arbor suffers from summoning sickness and can’t tap for mana the turn it enters the battlefield. He replied “I didn’t know that, I’ve been doing this all day and nobody told me that”. He seemed honest and I just remind them to be more careful next time. I asked back if after the interview he had considered that the player had cheated and he told he seemed honest with his argument. The player said he have been testing the days before the tournament with a maindeck Path to Exile and he had only removed it that morning, so his hand with a Path to Exile seemed normal to him. The Top 8 ran smoothly, with no calls at all. After the Top 4 had been defined, they asked the HJ to reorganize the prizes, so each one of them would get away with a Tarmogoyf and another staple. The HJ said that was legal as long as they didn’t do it in exchange for any results and the TO agreed with the redistribution. The TO did it and players kept playing up to the finals, won by Ivo Fernandes. No more situations happened. Overall, the event ran smoothly. Despite having a short team, there were no major incidents, and we had a good floor cover. I learned a lot judging an event this big and there were some new things I could learn with it and I believe experiences like this help any judge develop skills he couldn’t develop otherwise. Q: AP controlled Aven Mindcensor and he activated Ghost Quarter targeting one of his opponent’s lands. The opponent searched the top 4 cards of his library but neither of them were sure where did the cards go next. Do they stay on top in a random order? Do they get to the bottom? A: I instructed both players to read again Ghost Quarter text. The replacement effect only applies to the “search” portion of the text, so they have to complete the instructions written on the card, specifically where it says “shuffles his or her library”. Q: NAP was at 8, controlled 3 Phyrexian Unlife and was being attacked by AP’s Death’s Shadow, that was at 4 life. NAP casts Angel’s Grace and neither of them knew what was the outcome of the attack. A: I explained that Angel’s Grace replacement effect would stop NAP’s life from going lower than 1, thus before we could apply Phyrexian Unlife effect. So, after the attack NAP kept his 1 life and had 0 poison counters. Q: AP was attacking with his Reality Smasher and NAP blocked with his Death’s Shadow while at 10 life. AP decided to deal 3 damage to the blocking creature and 2 to the defending player and asked if Death’s Shadow would die. A: I explained them that as combat damage is dealt all at the same time, when SBA’s are checked, Death’s Shadow has 3 damage marked on it, and NAP is at 8 life, turning the creature a 5/5, and letting it live. Q: During the round, there was also a call involved where a player wanted to suspend his Rift Bolt, but his opponent had a Thalia, Guardian of Thraben on the battlefield and he wanted to be sure when he must pay that 1 mana from Thalia. A: I answered that it must be done when the cast really happens, so when the card comes off suspend. Q: NAP had called because he controlled a Thalia, Guardian of Thraben and AP had played an Engineered Explosives with X=1 and tapping his Forest and his Mountain, placing 2 counters on the artifact. NAP was positive this couldn’t happen.